So I started the day a little down in the dumps. My dough hadn't really done anything in the fridge overnight except sag a bit. I took it out and let it sit on the counter and come to room temperature for about four hours, by which time it seemed to be perking up, but it still looked a bit flat to me. Had I let it ferment too long? Past the point where the yeasties had any food to eat? Mrrrrrhh. Thus it was with a slightly resigned air that I fired up the oven to 500 degrees, put the steam tray up on the top rack, tossed my first dough-lump into my cornmeal-dusted Dutch oven, gave it a quick score then four steam blasts, and covered it up for the bake. After half an hour I took the cover off and let it bake another fifteen minutes. Still seemed to have not gained much airiness, still looked smaller than I thought, still not quite as golden-brown as the pictures I'd peered at on the web. But the taste, o my brothers and sisters, the taste. Wonderfully crispy and fight-back tough on the outside, creamy and quite tartly (if not aggressively) sour on the inside. This could easily be something I'd buy in the San Francisco airport for careful smuggling back home. I was having old Jez-buds over and when they'd asked if they could bring stuff, I just said "Sure, whatever you think will go well with fresh-baked sourdough." From left to right: spicy feta-spinach dip, "meadow butter," duck fat, piquillo jalapeño bruschetta, Spanish Manchego, aged Brie and veal/pork/beef meatballs in an intensely garlicky tomato sauce. Readers, it was a veritable Breadapalooza. The first loaf was annihilated within minutes, with me saving an end scrap for missus chritter who was held up at the hospital, but there was more to come. 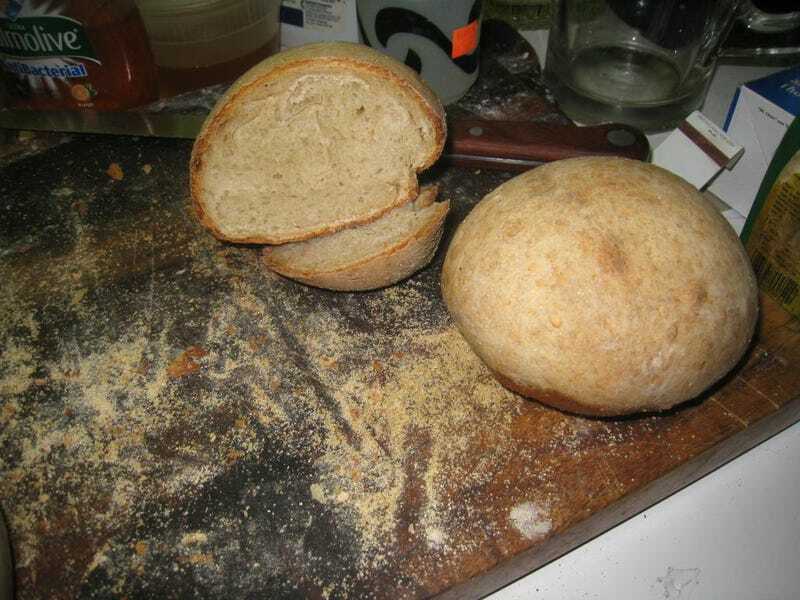 The other half of the dough was shaped into two boules that, if anything, were even better than the large loaf [see the header image]. And, miraculously, they kept their shape and didn't collapse into twin pancakes. So some days you win, some days you lose, some days it rains. Today was a winner. There's little more gratifying to the amateur baker than the silence and quiet "mmms" and "ooohs" as good friends devour your breadstuffs. I sent one bake-curious pal off with half of my remaining sourdough starter in a pint tub, I'll feed my own colony tonight and get that back before it goes back into the fridge for hibernation. Maybe I'll give that citric acid trick a try next time around. A good day in the kitchen. Happy baking, Groupthink!